Not too many surprises in the small school rankings this past week as only three total schools who were in the top 10 previously were bumped from their corresponding top 10 spot. There was also minimal movement at the tail end of the three divisions with only a couple of schools getting supplanted from the Top 25. In D-II a third team in three weeks was anointed No. 1, but the previously pole position schools still remain in the top three. A similar situation exits in the NAIA rankings. The same three teams that started the season in the top three remain, albeit in slightly different spots. In D-III each of the top three have remained the same since the preseason, but only a single game (a 25-3 dismantling of Stevens by Rowan) has been played by the trio. Now that March has arrived don’t expect those trends to continue. Limited early season schedules and weather has kept games to a minimum, but the innings and stakes will both escalate as winter turns into spring. Following are the small school rankings as they currently stand. Rankings are based on games through Sunday, March 3. Coming off a pair of road wins against their new Rocky Mountain Athletic Conference rival Dixie State over the weekend, the Colorado Mesa Mavs usurp North Greenville for the designation of being the No. 1 team in D-II. CMU’s duo of JR McDermott and Garrett Hutson are a big part of the reason the Mavs have moved up into the catbird seat. McDermott, who only made three starts last season, but had went 9-1 with 108 strikeouts in 2017 and was an All-American as a freshman in 2016, hasn’t missed a step due to injury. In his four starts this season he has only allowed a single earned run in 18 innings with a staggering 20-to-3 strikeout-to-walk ratio. Hutson, who was recruited by Wichita State and Oklahoma State, has finally found a home in Grand Junction after bouncing from school to school the past three years. In his four appearances on the mound he’s accumulated 16 1/3 innings while only allowing eight hits and a single walk with 27 strikeouts. Offensively Jordan Stubbings, the RMAC Freshman of the Year last season, is topping the team with a .409 batting average and senior outfielder Hunter Douglas is leading the team in home runs and RBI. While their schedule so far hasn’t been overly daunting it hasn’t been a cakewalk either. The big measure to see if the Mavs will be a legit national contender at the end of season will come later this month when they face the exceptional Mikey Gangwish and the Colorado School of Mines. The Orediggers are a team on the upswing as of late and will unquestionably make the Mavs prove their mettle. The team that made the biggest ranking move this week was USC AIken. The Pacers started the season at 23, but jumped up to 12 after easily outscoring traditional Peach Belt Conference bully Georgia College over the weekend. Like the aforementioned Mavs, the Pacers have an enviable 1-2 starting pitching punch, which has made them formidable. Zach Refuse and Mitch Spence have gone a combined 7-1 in their 10 starts and have struck out a combined 58 batters while only allowing 12 walks between them. This past weekend they only allowed three earned runs to the powerful Bobcat lineup in 13 innings on the mound. USCA has a formidable schedule ahead of them this week and it will take a tremendous effort to keep the wins compiling. They play both Catawba and North Georgia on the road, teams that are currently ranked 18th and seventh in the nation, respectively. Speaking of North Georgia, Parker Morrison may be the runway D-II MVP based on his early numbers. In his 10 appearances on the mound he’s earned three wins and five saves. This is in large part to him only allowing nine hits and five walks in 19 2/3 innings with 34 strikeouts. Opposing batters are three times more likely to strike out against him than collect a hit. New to the D-II rankings are traditional power Mount Olive and a return by West Florida, who went on a ranking hiatus last week. The Trojans earned their way after taking two from Belmont Abbey and the Argos returned after sweeping Mississippi College in a crucial conference series. The two took the spots over a drastically underperforming UNCP team and St. Leo, who’ve had little wiggle room since starting the season at position 24. Dropped out: UNC Pembroke (18), St. Leo (24). There was very little of note regarding the teams at the top of the NAIA rankings with the top 11 going a combined 41-3. As such each remained in their same position. Second-ranked Georgia Gwinnett did lose to No. 9 Middle Georgia State, but the extra innings midweek loss didn’t affect the rankings. The biggest news of the week is that the Warner Royals make their first-ever appearance in the Perfect Game Top 25. The Royals cap the Top 25 after humbling Point Park 14-2 and sweeping four games from Judson, a team that won the Chicagoland Collegiate Athletic Conference last season. Earlier in the season the Royals also earned quality wins over Florida Memorial and Keiser. Currently Warner is getting it done impressively both in the batter’s box and on the mound. On offense the team is second nationally in hits and is also in the top 10 in runs and stolen bases. Pitching-wise Warner is fourth in total batters struck out. Individually, Alex and Xanders Vazquez have been pummeling the ball. They are batting .458 and .439 respectively with Alex adding four homers and 32 RBI. The Royals also have a third player, Ronny Penalo, who is also batting over .400 while already accumulating 11 stolen bases. Michael Batten has been a glorious addition to the team since transferring from Southern Wesleyan. He had struck out 200 batters in 189 innings for the Warriors and those numbers are crescendoing in Florida. He’s struck out 34 batters in 20 innings and held opposition to a 2.70 ERA. Traditionally Warner has been an also-ran in the The Sunshine Conference standings, but every few years they bust out and finish with a win total in the middle to upper-30s. It appears that 2019 is going to be one of those seasons, perhaps due to an extended postseason run last spring that had them finish as the National Christian College Athletic Association World Series runner-up. The Royals have a number of games against northern-based teams upcoming which should further increase their win total. However, at the end of the month they have the daunting task of facing Southeastern and St. Thomas in back-to-back series. In addition to Warner, three other teams made their 2019 NAIA Top 25 debut this week. Texas Wesleyan, Central Methodist and Tabor took the spots of Point Park, Campellsville and Lewis-Clark State. Warner’s wins (combined with a sweep at the hands of SEU) bumped Madonna from the list. Two NAIA individual players need to get an overdue shout-out this week. Cam Coursey of Georgia Gwinnett and Dan Valerio of Southeastern were named to the Golden Spikes Award Watch List – the tandem represents two of only five non D-I players on the list. Coursey is currently second in the nation in batting average, hitting at a .552 for the Grizzlies. He also stunningly has 28 RBI and 27 runs scored in only 18 games with five triples. Valerio hasn’t been quite as stunning but is still producing and is a major reason why the Fire won the title last season and are currently ranked first this season. He is batting .321 with three home runs. Another player who could be on the list is Bryan’s Lake Burris. He is currently batting .361 for the eighth ranked Lions and is leading the NAIA with 11 home runs and is second with 30 RBI. Dropped out: Point Park (18), Campbellsville (19), Lewis-Clark State (20), Madonna (25). Late starts and incapable baseball weather has kept six teams from playing at all this season and eight were unable to take to the diamond last week. Consequently, there are little major modifications to the D-III Top 25 this week. The top five all remain the same primarily because they were only able to play two total games between them. One club that did make a substantial leap in the rankings are the Chapman Panthers. The Panthers hosted last year’s national runner-up Texas Lutheran and were able to score seven runs with two out to earn a win over the Bulldogs. The game featured a dominating pitching performance by Chapman closer Nick Garcia. He came in the eighth and struck out four batters in the innings thanks to a dropped third strike three. To close the game the fanned two more to give the 2003 National Champions the win. The school that was runner-up in the aforementioned 2003 season was Christopher Newport. The Captains may have had the best season to-date in D-III. CNU is 8-0 on the young season and have obliterated opposition. As a team the club is batting .324 and scoring 12 runs per contest. 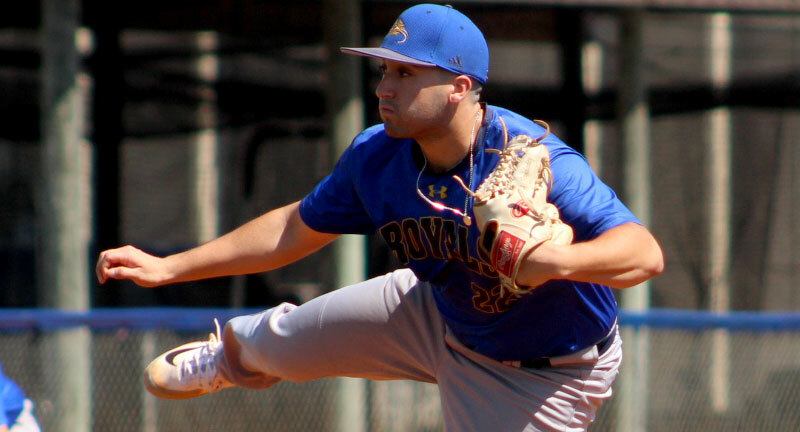 Their pitching staff, headed by Josh Husby – who has a 1.50 ERA and has only allowed 10 hits and three walks in 18 innings – has a team ERA of 2.00 and is holding opposition to a .178 batting average. With games against the ilk of Eastern Mennonite, Hampden-Sydney and Catholic University of America upcoming, those numbers could get even more obscene.